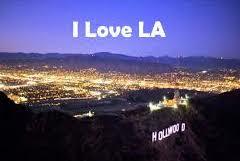 Nah, not really, in fact as a northern California native I was conditioned from an early age to hate L.A. It’s as if those from northern California get a ‘Hate L.A.’ gene at birth. We quickly are made aware that L.A. freeways are parking lots, that there are too many people there and the air is brown and you can actually sink your teeth into it. When I moved to southern California over 45 years ago, I heard my northern California friends say things like, “Can you believe he went to the dark side?” and “Don’t worry, he’ll be back!” I tried to tell them I was moving to Orange County, not L.A., but to someone in northern California all of southern California is L.A., except San Diego, which seems to get a pass. I found myself fairly welcome in Orange County as they also hate L.A. and are constantly trying to tell people who don’t know, that they are from ‘The O.C.’ not L.A., so I felt somewhat ‘back home’ in that regard. After a few years of living in southern California I guess I became ambivalent towards L.A., I didn’t hate it, but I also didn’t spend too much time there, since getting to and from the ‘City of Angels’ is usually a nightmare. But I’ve visited and enjoyed a good number of L.A. area sites, some recorded here in the blog, like Venice Beach, Watts, Rodeo Drive, Chinatown, Old Italy, Griffith Park and Malibu to name a few. But I just finished reading a book about how L.A. came to be, it’s entitled, The Mirage Factory, by Gary Krist and I was fascinated by the story of how L.A. was invented; yes, that’s the word he uses for the origin of Los Angeles. From around 1900 to 1930, Los Angeles went from a dusty hinterland town surrounded by deserts and mountains to a burgeoning city of 1.2 million on the shoulders of three ambitious and restless outsiders – civil engineer William Mulholland, filmmaker D.W. Griffith and evangelist Aimee Semple McPherson. You’re only recollection of Mulholland may be of Mulholland Drive, a famous road carved through the Santa Monica mountains, where early teenage Angelino boys took their girlfriends to park and ‘watch the submarine races’. It is now the road on which some of the most expensive homes in the U.S. are built, as it affords a magnificent view of the Los Angeles Basin, the San Fernando Valley and the Hollywood sign. Los Angeles would just not be, were it not for Mulholland, who understood that there was no way L.A. could grow significantly, because it was essentially in a desert with no potable water supply. 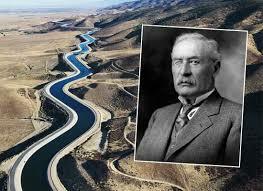 Mulholland solved that problem by heading up the building of a 233-mile aqueduct that brought water from the Owens Valley, which stretches from Lone Pine to Bishop on the Eastern side of the Sierra Nevada mountains, to Los Angeles. 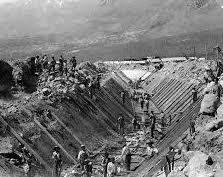 The building of the aqueduct was not without its share of contentiousness between the builders and the Owens valley residents, who saw their water being redirected to the south. Shootings and lynchings were not unusual. I’m not necessarily a big fan of Hollywood, but I found the story of how L.A. became the movie-making capital of the world fascinating. 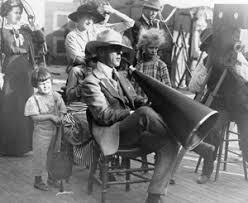 You may think of Cecil B. DeMille as the premier movie pioneer, but D.W. Griffith was his mentor. Griffith’s story of transplanting the movie industry from New York to Hollywood recalls lots of names you might be familiar with like Fatty Arbuckle, Mack Sennett, Mary Pickford and Charlie Chaplin, all silent movie stars. 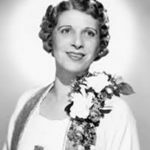 I was at least vaguely familiar with the previous two men’s name, but I’d never heard of Aimee Semple McPherson, but she was one heck of a evangelist, literally bringing thousands of people to her sermons every week. She was a determined juggernaut who dealt with much controversy in her teachings, sermons, healings and even a kidnapping, or was it fake? Using radio for the first time, she almost singlehandedly brought religion to this bustling and growing metropolis that would soon take its place as a world class city. So, while I don’t love L.A., I now have a greater respect for how the city was built, or invented; and how it has become one of the most diverse and interesting cities in the world. This past weekend started the biggest sporting event in the world, and you very well might not have even had an inkling that it was even taking place. No, you didn’t miss the World Series, the Super Bowl or March Madness, you missed the start of the World Cup. It usually doesn’t get much play here in the U.S. and it particularly won’t this year as the U.S. didn’t even qualify for the tournament, which seems almost impossible given that countries like Morocco, Iran, Croatia, Serbia and Senegal did make the top 32 teams in the world. A good analogy might be as a kid, this would be worse that being the last guy picked on some pick-up ball game in the neighborhood, it’s like being sent home to practice the piano while the rest of the neighborhood played the game. So, why are we so bad? Possibly we have a hard time getting grown men to run around on a big field for several hours hitting the ball with their feet and heads all resulting in a score of 1-0. But the rest of the world loves football, what we call soccer, so one wonders, ‘what are we missing?’. World Cup history is filled with stories of fights and even deaths over a team winning or losing a World Cup match. World Cup fans make the Oakland Raider faithful look like they are attending a Shirley Temple birthday party. Victoria Beckham. Not really interested in what David looks like! I’m a bit conflicted on this year’s World Cup. Again, I’m not a big fan of soccer, sorry I still can’t call it football, but I haven’t really taken the time to understand the nuances of the game. For me it’s a bit like hockey, where at least I know most of the rules of the game, but none of the intricacies or strategies, and even though there is not typically a lot of scoring, I’ve grown to like hockey. So maybe there is hope this year for me to enjoy the world’s most-watched sporting event along with the estimated 3 billion fans that are expected to watch the tournament this year. If you’re like me and a) weren’t aware that the World Cup was even going on, and b) do not really understand or care to understand the nuances of the game, and c) aren’t exactly sure what ‘Bend ’em like Beckham’ means, but you’d recognize Victoria Beckham in a Groucho Marx disguise, then perhaps you’ll enjoy some things I learned over the weekend from my local newspaper and the Internet regarding this year’s World Cup that may pique your interest . . . or not. Just think of it as focusing on lady’s hats and mint juleps instead of the horses at the Kentucky Derby. 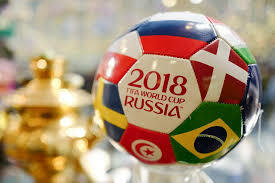 This year’s World Cup, in Moscow, started last Thursday and continues until the finals on July 15! Yes, a nearly month-long tournament. Since Vladimir Putin’s Russia is the host, it might be important to know some of the history of the host countries. The host gets to pick a lamb for their first opponent – already Russia beat Saudi Arabia 5-0 (yes, they qualified for the World Cup!) on Thursday in the opening round. In 1934 Mussolini’s Italy, which didn’t have a particularly great team, magically won the tournament!! Same thing happen in the ‘70s when a post-Juan Peron’s military junta insured that a less than stellar Argentina team won it all in 1978. So don’t be surprised if a below-average Russian team does something spectacular. The World Cup tournament started in 1930 and has been played every four years except 1942 and 1946 due to that skirmish going on in the world at the time. 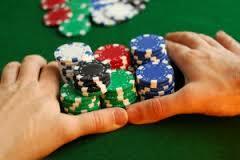 Brazil’s team is the most expensive team in this year’s tournament with a worth of approximately $1 billion! 66,000 Iceland fans (yes, Iceland made the tournament too!) wanted tickets to the games in Moscow meaning that 20% of the population of that country wanted to go to Russia to watch the games. Next World Cup is in 2022 in Qatar – yes, they have a team too! 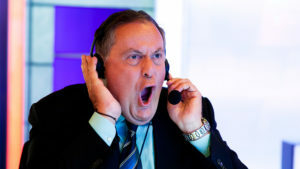 If you can catch NBC Latino tv/radio, after a goal you’ll be entertained by renowned soccer announcer, Andres Cantor’s when he calls out his famous Goooooooooooooaaaaaaaaal! You’ve already missed the Egypt-Uruguay thriller (yes, they both have teams in the tournament), but check your local listing for Tuesday’s game between Nigeria (Really! They’re in it and we’re not?!) and Argentina, the over-under on total points is 1. Two Sides of Washington D.C. Most of our readers have been to Washington D.C., so telling you about my trip and how cool the Air & Space or Spy Museums were or how I could spend all day in the Natural History Museum is a waste of time, so I’ll tell you about my top four emotional experiences in our nation’s capital and environs. 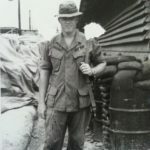 To those around my age, the Vietnam War happened when we were in college and the years shortly thereafter, which was a time of great social conflict in our country. 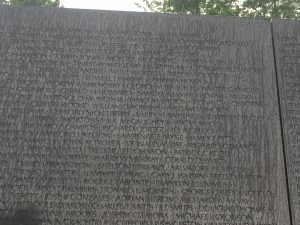 So seeing all the names on ‘The Wall’ was a sad reminder of that horrible time in my young adulthood. Suzanne does a great job of honoring fallen soldiers from our hometown of Novato each Memorial Day. 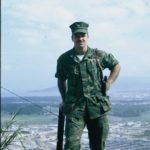 Among those honored is Allen Joseph Nelson Jr., who was one of the only people I knew personally who was killed in action in Vietnam. Allen and I played high school football together as well as a year a Marin J.C. I knew his sister, Joanne, who was in my class at Novato, and is no longer with us, but I believe the younger brother, Steve, who was in Suzanne’s class, is. I would ask that anyone who knows him please pass along to him that I located Allen’s name on the wall (Top line of panel 13E) and said thank you and a silent prayer. First opened in 1993, this museum is relatively new to ‘The Mall’. The tour through it is detailed and emotional. Upon entering you receive a passport-like document of one of the victims of the Holocaust, which traces their country of origin and their life prior to being incarcerated as well as what ‘death camp’ they were in, and the date they died or were freed – it really personalizes the tragedy of it all. The museum is filled with photos, artifacts and videos of events leading up to and through the loss of the war by Germany and the subsequent release of the surviving prisoners from the concentration camps. The exhibit that shows hundreds of victims’ confiscated shoes is particularly gut-wrenching. 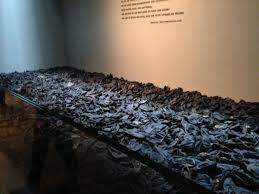 While most people are generally familiar with the story of the Holocaust, the museum does an excellent job of bringing home the sheer brutality of this heinous crime against humanity. It still seems incredible that it even took place and how many people it affected and particularly how an entire country could let this happen within their borders. 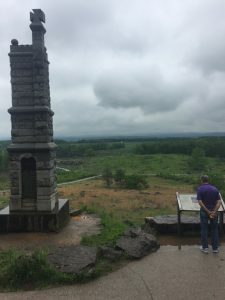 At the suggestion of a friend, who said that if you’re going to D.C. you need to get up to Gettysburg, we rented a car and made the hour and a half drive to this famous Civil War battlefield in Pennsylvania. The information center there is filled with all kinds of memorabilia and ways to learn about one of the bloodiest and arguably the most pivotal battle of the war. We chose the in-car CD version which allowed us to stop for as long as we wanted at any particular site. The battle field, which was much larger than I thought (over 9 square miles) is dotted with over 1,300 memorials, markers and monuments. Being there and listening to the narration, some stories about brother fighting against brother, gives you a real sense of how and where things were taking place. In the 3-day battle on July 1-3, 1863, the total of casualties for both armies was approximately 50,000. I was astounded to learn that while we have had approximately 1,264,000 casualties in all of our wars up until now, nearly half, 620,000 were casualties of the Civil War. Just across the Potomac River from The Jefferson Memorial, on property once owned by Robert E. Lee, our national cemetery is a tearfully beautiful place. While the tour through the cemetery talks about all the famous people who are interned there, you cannot help but be struck by the total number of simple gravestones all in a line, “like soldiers at attention”, that are there representing fallen soldiers from every one of our nation’s wars – there are over 400,000 in all buried there. 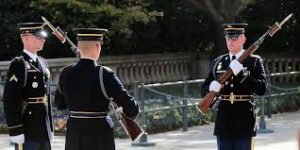 We witnessed a changing of the guard at the ‘Tomb of the Unknown Soldier’, a classy and somber ritual that occurs every half hour this time of year. The grounds offer hundreds of amazing stories that go with the brave service men and women who make this their final resting place. While we really didn’t appreciate the rain that fell everyday we were in Washington D.C. and Gettysburg, it seemed to particularly lend itself to the atmosphere of these four historic landmarks that reminded us that our freedom is not free. 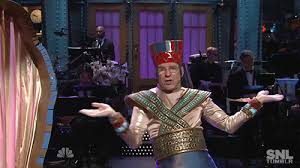 You’ve probably heard the name King Tut, and perhaps, like me, one of the first things that comes to mind is Steve Martin’s wild and crazy song and dance back in 1978. But, you knew at some level there really was a King Tut, he was from Egypt, fairly young and . . . OK, maybe that’s about it. If that’s the case, come with me now as I go back in time over 3,000 years, and it seemed that way as I slugged my way through L.A. traffic to see the latest exhibit of King Tut at Exhibition Park, next to the Los Angeles Coliseum. Our first stop is the seven-story screen of the IMAX Theater showing The Mysteries of Egypt. Stay with me, as it’s only about 20 minutes long and it’s actually very interesting, even if Egyptology isn’t your thing. The film tells the story of why King Tut’s tomb was so hard to find. Prior to his death in 1323 B.C. Egypt buried their Pharaohs inside massive pyramids, but since they also buried many treasures with them, so they could have them in their ‘after-life’, burglars were able to easily find these treasures and use them in ‘now life’ – as you can probably figure out, the pyramids weren’t that hard for the burglars to locate. 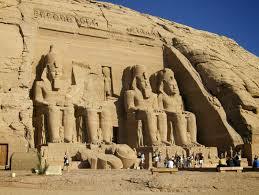 So they started burying their Pharaohs out in the vast desert known as the Valley of the Kings. After five unsuccessful archaeological trips to Egypt to find Tut’s burial place, the sixth time was the charm for British archaeologist, Howard Carter, who unearthed the buried tomb in 1922. He married that year to his half-sister, a 13-year old named Ankhesenpaaten, who later changed her name to Ankhesenamun, obviously to make the spelling of her name easier. Legos, Playstation and a new bicycle were items on their wedding gift list. He wasn’t really what one might see as a majestic royal figure. He was slight of build, large front incisors, with an overbite, a slightly cleft palate, irregular curvature of the spine and a fused neck. He had a clubbed left foot, which necessitated a cane for walking most of his life. DNA samples of his bones show that he had the first known infectious malaria disease. Other than that he was a picture of health. It seems strange to me that we know the gestation period of his wife’s two stillborn children, but don’t have a clue as to how he died! Keep digging!! Oh yes, on to the Exhibit Hall; actually after reading about the search for his tomb and his interesting life, the actual artifacts found in his tomb, many on display here, are a little less interesting to me. 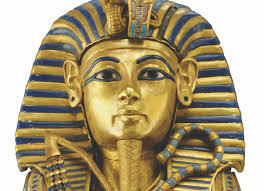 Don’t get me wrong, there are some beautiful pieces, over 5,000 of them were found in the tomb, things like furniture, jewelry, chariots, food and of course his golden coffin and the iconic mask. If you go . . . The exhibit will be here until January 2019; if you go during the school year you’ll be accosted by thousands of L.A. elementary school children on a field trip as I was, yelling, fighting and throwing food – I’d go during the summer or on a weekend, but I’d go. Another tip, when you go to the gift shop don’t by the King Tut CD, he recorded it before his voice changed and he sounds more like Cleopatra. I didn’t have to go too far to go back to the 1950s. 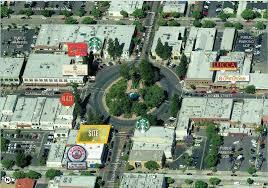 This week’s journey was a short jaunt down the road to Old Town Orange and the iconic Orange Circle. I’m not suppose to call it that, it’s the Orange Plaza, but it’s a circle, or more accurately, a ‘round about’ in the middle of town and it’s been a circle since the 1870s. It is surrounded by one square mile of historic buildings offering 50 different architectural styles from Spanish Colonial to Victorian. This area is the ‘antique capital’ of Orange County, with some 79 antique stores; there actually used to be more, but some have given way to eateries that now make ‘The Circle’ a destination for diners. So last Thursday morning I headed to Old Town Orange, not to look at antiques, hell if I wanted to see an antique, I could just look in the mirror, but to have breakfast at Moody’s. 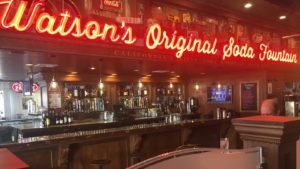 Of course no one calls it Moody’s any more; it’s now Watson’s Original Soda Fountain & Café. 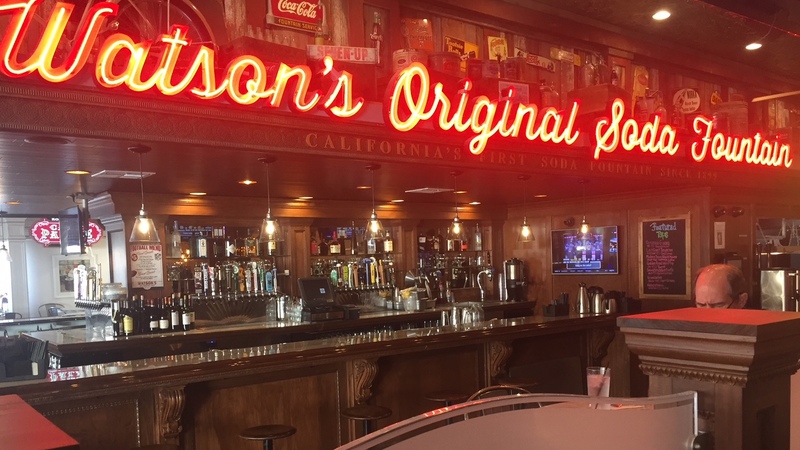 It’s actually been Watson’s since 1889 and it is the oldest continuous running business in Orange County and the oldest soda fountain in California. But for a while in the 70s a guy named Moody ran the soda fountain side of the pharmacy and when I lived about 5 blocks from there, that’s where I took daughter, Stephanie for a treat, starting when she was about four. Her favorite treat was the chocolate ‘milkshape’, as she called it. It came in a tall soda fountain glass with a straw and a long-handled spoon, accompanied by the extra milkshape in the frosty mixing tin. It was delicious! Going to Moody’s for a milkshape became a regular thing. 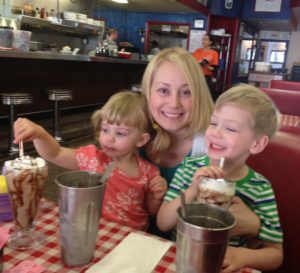 To continue the tradition, I’ve recently taken Stephanie and her kids, grandchildren Dylan and Emma, to Watson’s for whatever they wanted, as long as it was a chocolate ‘milkshape’! But on this crisp fall morning I wanted to check out the ‘breakfast scene’ at this historic diner; have some eggs and a cup of hot coffee and see if there were some old codgers gathered around a cracker barrel to shoot the breeze. There weren’t. 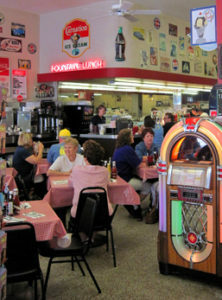 It was quiet except for the juke box playing some great old 50s tunes. They did a great job of keeping some of the old décor and adding some new artifacts, including an old telephone operator’s switch board, a huge old time safe and a door off the diner that reads, Proprietor, Kellar E. Watson. Kellar purchased the Orange Drug Store in 1899 and renamed it Watson’s, but he didn’t open the soda fountain until 1915. It wasn’t always a 50s theme because . . . the 50s didn’t happen until . . . the 50s! Now the multiple TVs that hang from the ceiling are flat screens, but during certain hours they show 50s reruns like I Love Lucy, Mr. Ed and The Andy Griffith Show. The fare includes the usual breakfast items as well as hamburgers, fries, sandwiches, cherry cokes, banana splits and, of course, ‘milkshapes’. The only major change from earlier menus is that now one can get an adult beverage there, which I don’t think interferes with the theme; I mean liquor was around in the 50s! So how was my breakfast? I couldn’t resist, at 7:30 in the morning I ordered a chocolate ‘milkshape’. The server looked a little surprised, but said she would have to plug in the machine. Several minutes later out came the tall soda fountain glass filled to the brim with whip cream on top and the extra milkshape in the frosty mixing tin. It was delicious! I had the privilege of spending a couple of days with three gentlemen, Ken, Joel and Terry with whom I attended Westminster College, where we played football together under the tutelage of future San Francisco 49er Super Bowl coach, George Seifert. We were Seifert’s ‘first team’ as a head coach, although he probably refers to us his ‘worst team’. The four of us have reunited on a few occasions since graduation, even one that Seifert attended, but it had been several years since we last saw each other, so it was time. 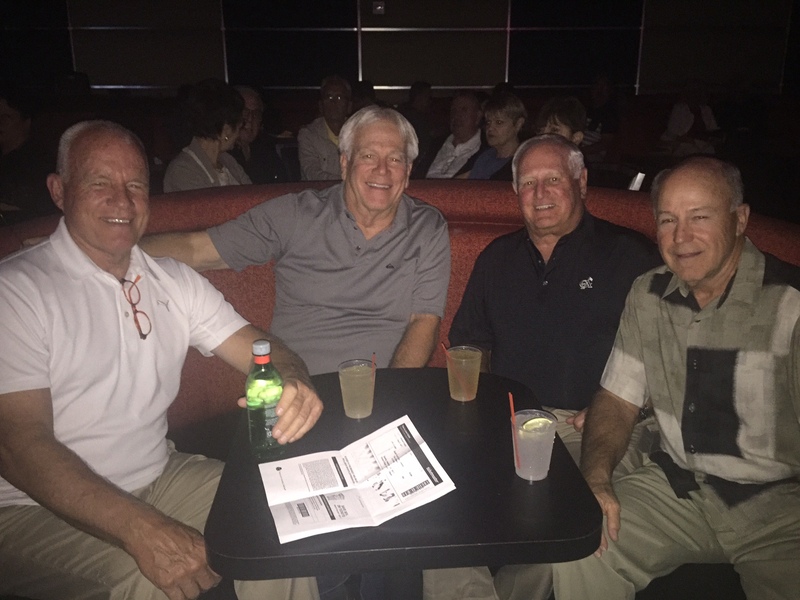 When you get four 70-something former football players together in Las Vegas, you’d expect a lot of stories under the heading of ‘The Older We Get, The Better We Were’. Not so with this group. While football was certainly mentioned, like during our first beer when we toasted to those players who are no longer with us, it was hardly the main topic of conversation. What was? To that in a moment. 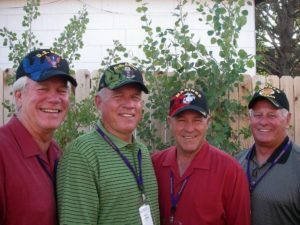 Suzanne has done a great job each Memorial Day of writing about and honoring those from our hometown of Novato, who made the ultimate sacrifice in the Viet Nam war; this story is about three guys that made it home, and I’m so glad they did. 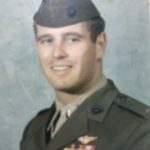 Ken Poulsen – Marine Lieutenant who was a Bombardier-Navigator in the A-6 Intruder jet. 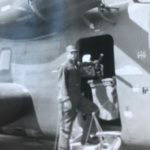 He spent 12 months in Viet Nam stationed in Da Nang where he flew ‘close air support’ during the day for troops on the ground and did ‘road wrecking’ of the Ho Chi Minh trail at night, where he was constantly under attack from anti-aircraft fire. Once out of the service, Ken went into education and ultimately became the Superintendent of Schools for a district in the Sacramento area. Ken retired several years ago and now lives with wife, Suzi in Chandler, AZ and when it gets too hot there, they head up to their second home in the mountains of Show Low, AZ. Ken was our cruise director for these couple of days together and put together a line up of shows, golf and meals that hardly gave us time to lose money in the casinos. 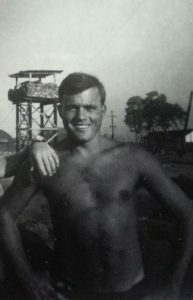 Joel Hall – Marine Lieutenant who earned both his Navy and Army wings and flew the CH-53 Sea Stallion and the UH-1 ‘Huey’ helicopters at Marble Mountain, just outside of Da Nang, during his 13 months ‘in country’. 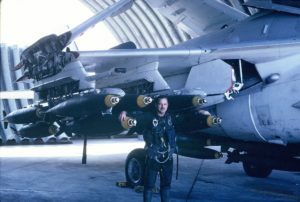 He flew various ‘support’ and ‘medevac’ missions and when I asked him if he often came under enemy fire, he said, “Oh yeah, and I had the holes in my aircraft to prove it.” After getting out, Joel went to work for the 3M company and retired from there after a 32-year career. He now lives in Atlanta on a golf course and when it gets too cold to play golf there, he and wife, Gayle have a second home on the east coast of Florida where they spend five months a year. Joel can hit a golf ball further and straighter now than he ever could, and his cigar never gets in the way. Fortunately, all three of these veterans were shot at without results. So the topic of conversation was about each of their personal experiences in Viet Nam; we touched on the Ken Burns documentary, The Viet Nam War, now playing on PBS, and the protests of NFL players in the form of sitting or kneeling during our National Anthem. We all felt that these NFL players can couch it any way they want, but make no mistake, by kneeling or sitting during our National Anthem they are disrespecting their flag, their country and the brave men and women who fought and the many who died, for them to have their freedom of expression. While those that lost their lives fighting for this country cannot be outraged at these demonstrations, these three veterans, who put themselves in harms way, can be and are. I came away from my time with my former teammates humbled and thankful to be able to call these three men good friends and so very thankful that they made it home safely. ‘God’s Waiting Room’ is the euphemistic phrase for where people 65 and over used to go to live while they were waiting to die. But the ‘Baby Boomers’ have done it again! They’ve changed everything. They’ve emptied the waiting room. Now 65 year olds are summiting mountains, jumping out of airplanes and running marathons. From the time the 78 million ‘Boomers’ were born (1946 -1964) they’ve had it their way. They were the first generation to be raised in the presence of television, which gave marketers easy access to millions of people who were now no longer just compared to the people around them, they were exposed and compared, to the entire world. So what did the Boomers do? They raised their game, they wanted it all, they demanded the best. They couldn’t always afford the best, so, unlike their parents who always saved before they purchased an expensive item, they popularized the credit card. Now, as the first of the ‘Boomers’ turned 70 last year, they are changing the ‘Golden Years’. Previous generations looked forward to finishing their 30-year career with the same company, retiring at 65 with a gold watch and living maybe another 8-10 years before cashing in their chips. Today at 65, we find Boomers starting their own companies, buying their own Apple watch and heading to the cashier’s window to buy more chips. They have literally changed the way to do almost everything; certainly they’ve changed how we think about aging. But to be fair, and just to help keep the Boomers humble, there have been some pretty successful ‘senior citizens’ throughout history. The following accomplishments are true, the parenthetical comments that follow are mine and subject to not being true. Clothing designer Calvin Klein, cast Lauren Hutton in an underwear ad when she was 73 (They actually cast her when she was 70, but it took her three years to get the underwear on). 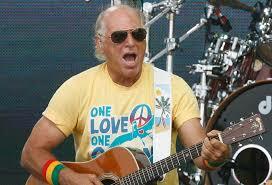 There have clearly been some outstanding accomplishments by those supposedly ‘past their prime’, but with Jimmy Buffett, who turned 70 last December, as their Pied Piper, I’m certain the Boomers will continue to show us a whole new way to ‘play the back nine’. Post Script: If you find errors in this post, please blame it on my sister’s arthritis remedy – who knew gin was health food?! An American tradition that has lasted more than 146 years comes to a close next month. On Sunday, May 21 at Nassau Veteran’s Memorial Coliseum in Uniondale, NY the Ringling Bros. Barnum & Bailey Circus ‘Big Top’ will come down for the very last time. And with it goes the threat that any of your children or grand children will run off and join the circus. It was called The Greatest Show on Earth, of course that was before Tiny Tim or Charo created their shows, but it was indeed a great show. I can attest to that personally, but first a little history. The circus as we know it today started in 1875 when Phineas Taylor Barnum (‘P.T.’ to his friends) was convinced to lend his name and his money to an existing circus that soon combined efforts with James Bailey’s circus and purchased the first elephant born in the United States and later purchased ‘Jumbo’ which was advertised as the ‘world’s largest elephant’ – a fact they couldn’t prove, but no one could disprove it either. That’s sort of the way old P.T worked. You may remember P.T. Barnum as the person that said, “There’s a sucker born every minute”. Actually it was never confirmed that he said that and in fact, he was known to be very courteous to his suckers . . . er, customers. P.T. 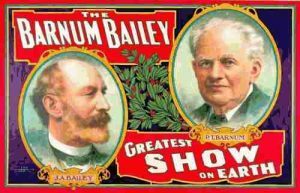 died in1891 and Bailey purchased the circus from his widow and continued to tour the east coast, until 1897 when he decided to take the act to Europe. A few years before that, five of the seven Ringling brothers had started a small circus in Wisconsin and when they heard that Bailey was taking his circus to Europe, they decided to head east, which apparently was circus-crazy. 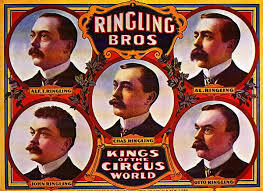 When Bailey returned from Europe he discovered that the Ringling Brothers were dominating the east coast, so he moved his circus out west in 1905. 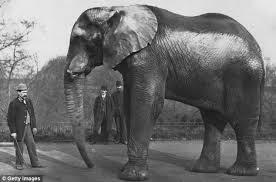 The next year Bailey died and a year later the circus was sold to the two remaining Ringling brothers. As the circus gained in popularity and size, a train was needed to move the circus from city to city and it became a popular spectacle to see the train pull into town and watch the workers set up the tents and work with the animals. In 1950 the train pulled into San Francisco when the circus was no longer performing in tents, but rather large permanent structure, so it set up shop in ‘the City’s’ Civic Auditorium. Our Dad and his Mom took brother Jack and me to the circus. I suspect that our Mom stayed home because she was pregnant with my co-writer. I remember a lot about that day and when I called Jack, who has the memory of an elephant, to ask him about his recollections, he happily filled in some of the details. We started recalling the things that we saw, the high wire act, the clowns (Emmett Kelly, the famous hobo clown was among them), a lion tamer, the ring leader in his top hat and of course, the ‘dancing’ elephants. We were amazed. To us, it was indeed the Greatest Show on Earth. You have to keep in mind that we didn’t have a television until a few years later. Through world wars, the Depression and various other wars and recessions, the circus endured and became part of our culture, part of Americana. But it’s easy to see why they are closing their doors, or tent flaps, now, what with their rising costs and dwindling attendance. With all the entertainment literally at the fingertips of today’s kids, the circus is too mundane, doesn’t move fast enough, too analogue in a digital world. I get it, but it’s still sad to see it go. 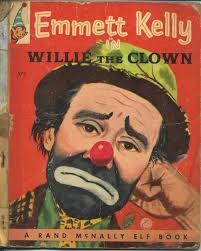 To Mr. Barnum, Mr. Bailey and to the five Ringling Brothers, you had an amazing run. Thank you for a great childhood memory. If you like our blog, please ‘share’ it on social medial, if you don’t like our blog, mums the word. I had the pleasure a couple of weeks ago of attending the wedding of Reid Hendrix in Dallas, Texas; Reid is the son of good friends and former ‘hood residents, Cap & Sharon Hendrix, but no relation to Jimmy Hendrix. 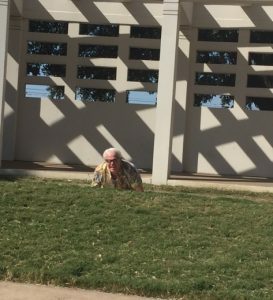 It is hard to mention the city of Dallas to people of my generation and not have them think of the Kennedy assassination. 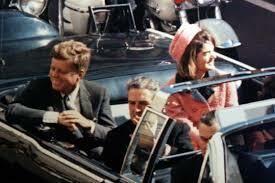 It was 53 years ago this week when we all not only remember the date of November 22, 1963, but we all know exactly where we were and what we were doing when we heard the news – “President Kennedy has been shot”. 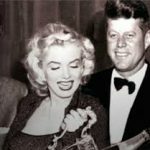 Our generation saw Kennedy as a young, energetic, charismatic leader; who we were less concerned about his politics and policies than we were about the goings-on of Jack and Jackie in ‘Camelot’. That day in Dallas was an historic day in many ways. To me ‘the 50s’ started in 1954 when Bill Haley and the Comets released Rock Around the Clock and ended with the Kennedy assassination. The age of innocence was gone as it was less than three months later when the Beatles made their first appearance in the United States and the psychedelic 60’s were underway. Although I have traveled to Dallas many times on business, I have never visited the site of the Kennedy assassination, the Texas School Book Depository, or as my colleagues called it, the Book Suppository (Ouch! 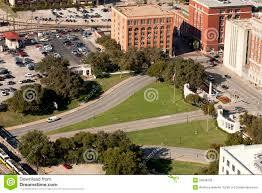 ), maybe that’s part of the reason it’s been renamed the Six Floor Museum at Dealey Plaza. Regardless of the name, they’ve done a great job of telling the complete, albeit controversial, story of the assassination and the strange series of events that followed. The self-guided tour through the museum exposes you to historic films, photographs, artifacts and interpretive displays that document the events surrounding the assassination. The museum presents the background of Lee Harvey Oswald and what might have been his motivation to shoot Kennedy, the story of Jack Ruby, who shot Oswald two days after Oswald shot Kennedy, and the Warren Commission’s report that unconvincingly concluded that Oswald acted alone. It is a conspiracy theorist’s paradise. The highlight of the tour for me was standing by the window on the 6th floor next to the site from where the gunshots came (one can not stand exactly where Oswald was as it is surrounded with Plexiglas). While standing there, one can see a video simulation of the Kennedy convertible turning the corner and coming right toward Oswald (presenting him with what seemed to be a much better target than the car later offered), then taking a left turn on Elm Street (Elm Street?!) where after Kennedy’s convertible moved laterally away from Oswald’s perch until it was about 100 yards away, at which time the shots were fired from the rear. 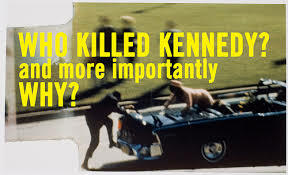 And to me the most interesting controversy revolved around the ‘Magic Bullet Theory’, which goes as follows: Allegedly one bullet passed through President Kennedy’s neck and Governor Connally’s chest and wrist and embedded itself in the Governor’s thigh. If so, this bullet traversed 15 layers of clothing, 7 layers of skin, and approximately 15 inches of tissue, struck a necktie knot, removed 4 inches of rib, and shattered a radius bone. A magic bullet indeed! While the tour told an interesting and detailed story, I came away disturbed, disturbed that we still don’t know all the facts of what really happened that day, and why. Viable cases have been made for various murder suspects, including Vice President Lyndon Johnson, the CIA, the KGB, Fidel Castro, a Secret Service agent and the mafia, just to name a few! A lot stuff just doesn’t add up. So if our government didn’t give us the real scoop on this, I’m going to look into that so-called moon landing we did back in 1969 and perhaps start searching for Elvis, who may still be alive. This week we will, or already have, decided who will be our next president, or perhaps more accurately, decided who we want to keep from being our next president. 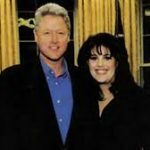 In a desperate move to help us all to feel better about our new president-elect, I thought I would look at the ‘character’ of some of our past presidents, who had the huge advantage of not living in this era of ‘social media’ where everyone carries a camera and bad news travels at the warp speed of the Internet. As it turns out our founding fathers weren’t without their flaws, both Washington and Jefferson owned slaves, in fact Jefferson was more than a groper, he fathered six children with slave, Sally Hemings – that would have been a little difficult to keep off the TMZ network today! military government in Washington DC and used military force to keep the Maryland legislature from meeting so that it couldn’t vote on secession. I suspect that WikiLeaks would have had a field day with old ‘Honest Abe’. 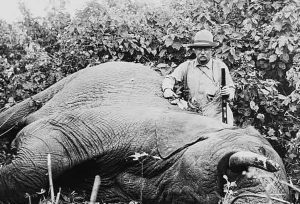 Teddy Roosevelt’s lust was of a different sort, he lusted for war. His imperialism and racism can be summed up with the following quote from him, “All the great masterful races have been fighting races,” he claimed. To fellow Anglo-Saxons, he said, “It is wholly impossible to avoid conflicts with the weaker races,” and added, “The most ultimately righteous of all wars is a war with savages.” I’m guessing that Hitler was a big fan of Teddy. OK, that takes care of Mt. 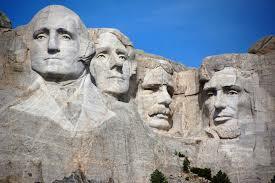 Rushmore, but there is plenty more . . .
secret agent. But he swore that those documents only contained information about how he was going to fly a kite to invent electricity and Chelsea’s wedding. 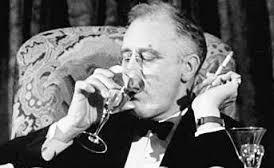 Franklin D. Roosevelt was known to lie a lot (What? A politician lying!!!) He was in terrible health, which he kept from the public, he was said to have liked Stalin too much and he had Soviet spies in his cabinet and didn’t really care, family members enriched themselves by his being in office, the New Deal actually slowed the recovery from the Great Depression and, among other things, he was accused of trying to seize control of the Supreme Court. Gosh, he could easily get elected today! John Tyler – fathered 15 children with two different wives and had several more with his slaves; in November 1836 he became the Whig’s party president ‘erect’. Andrew Jackson invited prostitutes to the White House Christmas party – I’m sure he just wanted to make sure that there were plenty of Ho Ho Hos to go around! While Jack Kennedy and Bill Clinton are considered modern history’s best-know presidential horn-dogs, Lyndon Johnson, who called his naughty bits ‘Jumbo’, was worse than either of them. Both Grover Cleveland and Warren Harding were also known to have a number of dalliances while in the ‘oval orifice’. It is well known that FDR and Eisenhower (at least while a general in the army if not while president) had mistresses while serving in ‘pubic’ life. There’s more, lots more, but I think you get the point. So while you may think that we’ve reached new lows with this year’s two candidates, it’s actually just politics as usual, so we’ll be just fine. There now, don’t you feel better? Yeah, me neither! Even if this didn’t make you feel better, why not SHARE it, maybe it will help a friend with pre or post-election blues.